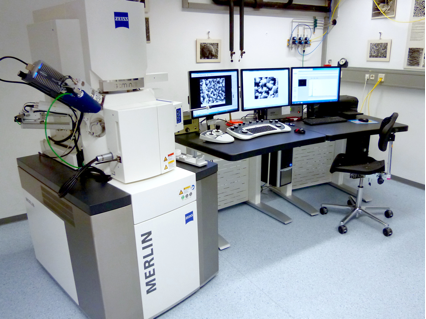 SEM imaging of materials and micro-devices. Computerized Field Emmission (FE) – Scanning Electron Microscope (SEM) with Patented GEMINI II electromagnetic/electrostatic objective lens system. EDS-System Bruker QUANTAX EDS-Detector (60mm²). Other: Gas Injection System (N2) for charge compensation. Target must be stable under vacuum and should not degas. A transfer system for air sensitive samples is available. Studying material or micro device (e.g. battery electrodes) structures. Determination of element distribution.